Plants will be grown on the concrete pillars of the New Garia-Airport Metro line in New Town to increase green cover in the township, reduce pollution and add to its aesthetics. The vertical gardens will be installed on the stretch from the box bridge in Mahisbathan that connects Sector V and New Town to City Centre II in the first phase. Work is already underway. Small, fast-growing plants will be placed around the pillars using a specially designed lightweight framework, a senior official of the New Town Kolkata Development Authority (NKDA) said. A special mat capable of retaining water for several hours will be wrapped around the pillars before small pots with saplings are set on it, the official said. The plants will be sprayed with water from truck-mounted pumps and also by drip irrigation. Plants capable of high dust absorption will be chosen to reduce pollution in the area. New Town is witnessing a real estate boom and rampant construction activities during the day and in the night have led to a high percentage of particulate matter in the air. Bryophyllum pinnatum or air plant, various types of ferns and flowering plants that can survive on little water and minimum maintenance will be planted. Heat-resilient plants such as euphorbia, phalphysia, yucca, sasivera, nerium, thuja and chuphia have been shortlisted for the gardens. Debashis Sen, the chairman of NKDA, said the idea of vertical gardens has been broached at meetings with the railway authorities. One such garden has already been installed on a wall outside gate No. 2 of Eco Park The Metro pillar near the box bridge and (below) the wall outside gate No. 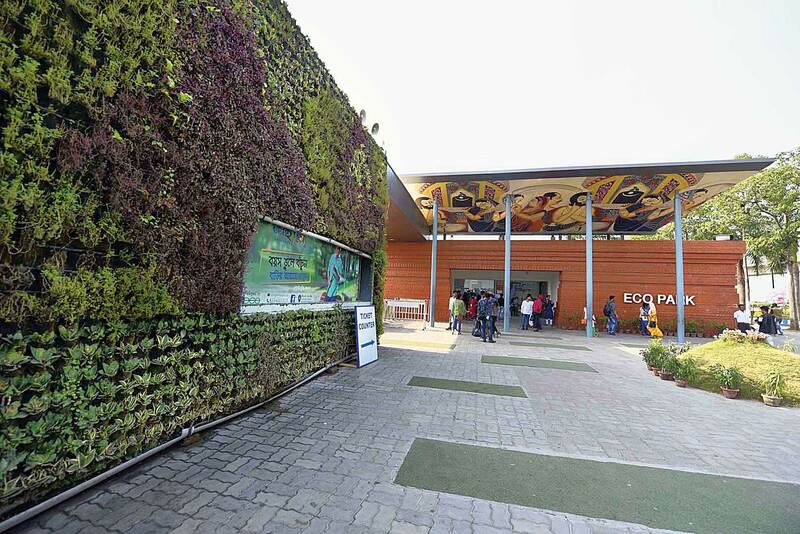 2 of Eco Park where vertical gardens have been set up. Pictures by Gautam Bose and this was shown to the railway authorities as an example. “Concrete pillars look stark and visually unappealing in an urban landscape. We are creating these green walls to help reduce pollution and also as a beautification project,” Sen said. More than 300 plants can be accommodated on the pillars, each of which is around 30 feet high. “A single such garden on a Metro pillar will have the ca- pacity to release more than 500 litres of oxygen every day. A Metro pillar near the box bridge has already been transformed with a vertical garden set up around it,” Sen said. Vertical gardens are popu- lar the worldover. Bosco Verticale — a pair of residential towers in Milan — has hundreds of plants on its walls. Gardens by the Bay at Marina Gardens in Singapore comprises several tall gardens..